A specially-designed platform was due to be lifted into place to allow engineers to inspect the suspension cables on the M48 Severn Bridge. 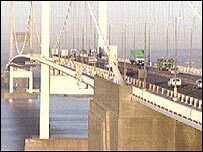 Traffic travelling out of south Wales on Saturday will be diverted across the M4 Second Severn Crossing from 0600 BST until mid afternoon. Lane two closures westbound are also planned to allow the 20m structure to be offloaded and swung across the road. The platform will allow inspection of the higher section of support cables. The M48 bridge, which links England to Wales at Aust in South Gloucestershire, will be 40 years old in September. The Highways Agency said it was a precautionary measure after cables on the Forth Bridge in Scotland were found to be corroded.